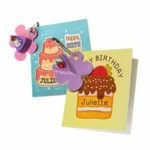 Girls learn about Juliette Low as they match the round sticker with the printed cards for these crafts for swapping from MakingFriends®.com. Fold back and forth on the perf lines of the tags. Gently tear apart. Write your SWAP information on the back. 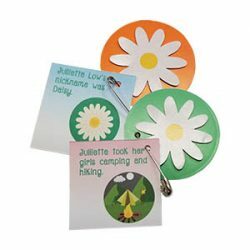 Glue daisies to disks. 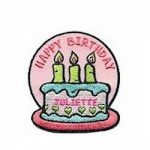 Read the Juliette Low fact and place the matching sticker on the tag. 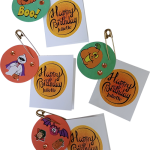 Use a hole punch (not included) to punch a hole in the tags and disks. Attach tags to disks with safety pin.